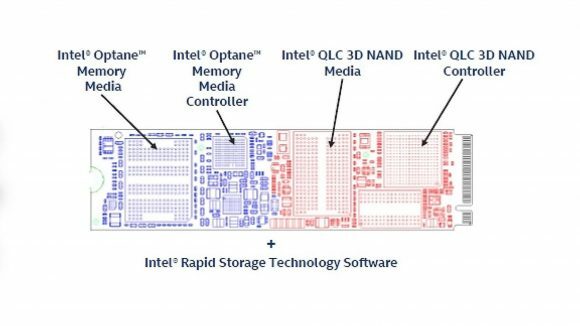 Intel is blending Optane memory with QLC 3D NAND flash into a single solid state M.2 drive. 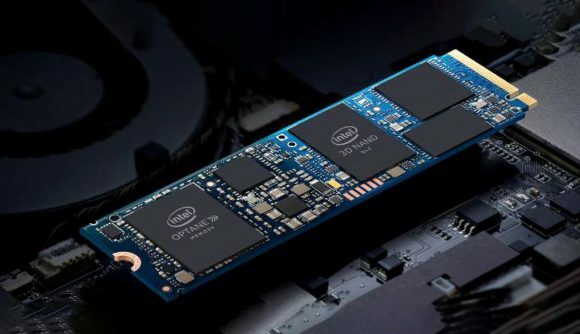 The Intel Optane Memory H10 with Solid State Storage – henceforth known as Intel H10 because I’m lazy – is targeting users that need the responsiveness of Optane but the capacity of QLC flash. It’s an interesting combo, and one that very few other manufacturers have the ability to replicate. Intel and Micron announced 3D XPoint back in 2015, the memory tech at the core of Intel Optane, which they touted as being a revolutionary new memory category capable of low-latency applications. Since then it’s made its way into some diddy HDD supercharger drives and pricey high-performance professional SSDs. Nowadays Micron and Intel have decided to go it alone, with Micron taking full custody of their shared memory fabs. But Intel is still committed to the tech, at least for the time being, packaging it with high-capacity QLC for a more affordable drive. QLC is near-enough the polar opposite of Optane, a four-bit, low cost SSD NAND flash that is slower and less reliable than its TLC, MLC, and SLC siblings, but is able to offer high cell density for cheap. So Intel’s H10 drive is split right down the middle. On one side you’ve got the Intel Optane memory and controller, and on the other QLC flash and its own bespoke controller. Each with access to half the bandwidth of the PCIe x4 connection. Intel’s H10 drive is available in three capacities: 16GB Optane + 256GB QLC, 32GB Optane + 512GB QLC, and 32GB Optane + 1TB QLC. And Intel’s highlighting low queue depth performance with the H10. Queue depth is a pretty simple concept: the number of I/O operations pending on a drive. Some drives are optimised for high queue depths, but Intel’s own in-house benchmarking suggests roughly 90% of applications operate at a queue depth of 1 – 2 for your average user. Hence, it’s hoping that chunk of Intel Optane memory will prove useful to the client market. But there are a few caveats. As with all Optane memory products, these are Intel ecosystem exclusives. That means you will need an Intel Coffee Lake chip, 8th or 9th Gen, with compatible 300-series motherboard to operate an Intel H10 drive. Intel has also confirmed “upcoming platform support planned”, which likely means these drives will support future 9th gen chips and potentially Intel Comet Lake. It’s also an M.2 2280 single-sided drive, so you’ll need a spare PCIe slot, rated to PCIe 3.0 x4, available on your board. But we don’t yet have a price for Intel’s H10 drive. OEMs will begin shipping product with systems starting Q2, 2019, so we will have to wait and see what sort of price premium Intel’s OEMs will attach to this hybrid drive once they start shipping. Hopefully then we can give this drive a whirl for ourselves and see how that touted system responsiveness and low-latency shapes up against the best SSDs in gaming.